This dish was the first recipe I ever published here on Dishes Delish! Since I’ve made it again, this is the redo coq au vin blanc! I know of bloggers who take down their earliest posts because they are embarrassed by them. They don’t want the world to see their unpolished work. Although I understand the urge because it’s hard to show that we are imperfect, I’m here to tell you that, as human beings, we are all imperfect. Why not glory in our humanity, give ourselves a break and embrace it? My imperfections stared me in the face recently. My dear friend Gabby, linked two of my granola recipes on her blog, The Tolerant Table! Check her out. She has great recipes! That was the correct thought and I’m glad it came so quickly. We all have to start somewhere, don’t we? Yes indeed, we do. So, I embrace my journey and revel at how far I’ve come in my food photography! I look forward to the time when I look back at these photos and revel in how far I have come again! Aren’t I so grown up? Here is a link to my very first post, which I used my iPhone and a naked light bulb to photograph. 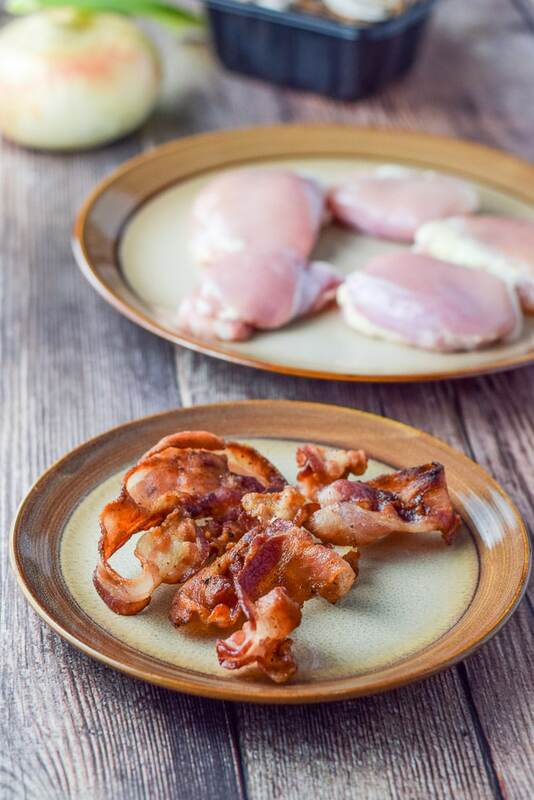 We have newly fried bacon, chicken thighs, onion, celery and mushrooms. I drool when I look at the bacon. Do you? But let’s back up a step. I didn’t want to show the bacon raw since it looks so much better cooked. Don’t you agree? I get my Dutch oven and heat it on medium. Then, I place 5 pieces of bacon in it and fry them until they are nice and crispy. I fish out the bacon and put it on a paper towel lined plate. Next, I leave the bacon grease in the pan, where I place the chicken thighs and sauté them for 3 minutes on each side. When done, I take the chicken out of the pan, place it on a plate and set it aside. There is still bacon fat in the pan so I add the sliced onion and chopped celery. I stir it every few minutes until the onion becomes translucent. It takes about 5 minutes. Next, I add the mushrooms, thyme, parsley, garlic, salt and pepper. I sauté it all for an additional 5 minutes. 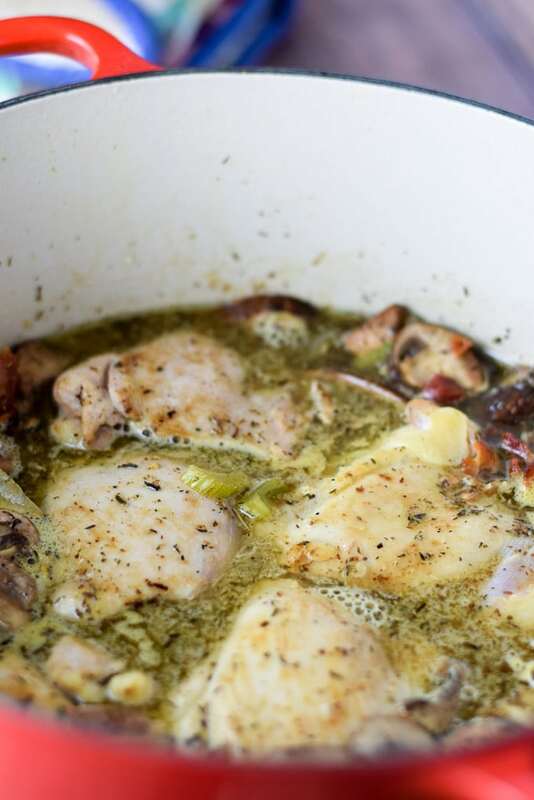 Time to add 1 cup of white wine, 1 cup of chicken broth and a bay leaf. I raise the heat and scrape the bottom of the pan for all the yummies stuck there. I add the chicken back in the pan and crumble the bacon over it. Time to place the Dutch oven full of the coq au vin blanc in the oven for 30 minutes. Once it’s done, I transfer it all to a smaller pan to serve it. 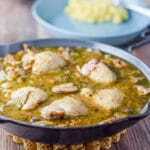 I make a salad, plate some millet and get ready to serve this delectable coq au vin blanc dish. Oh my gosh, is it good! Let us look at the coq au vin redux from a different angle. 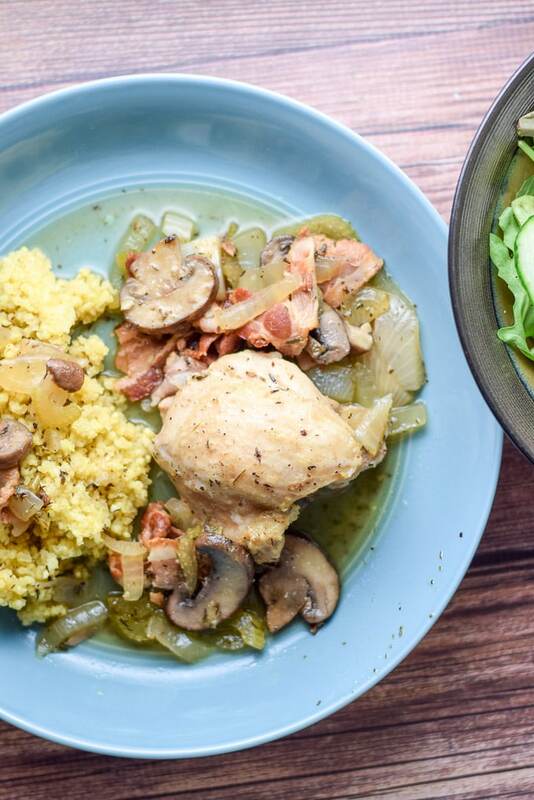 I hope you enjoyed this coq au vin blanc recipe as much as Christopher and I enjoyed eating it. Please leave me a comment, just because you want to. 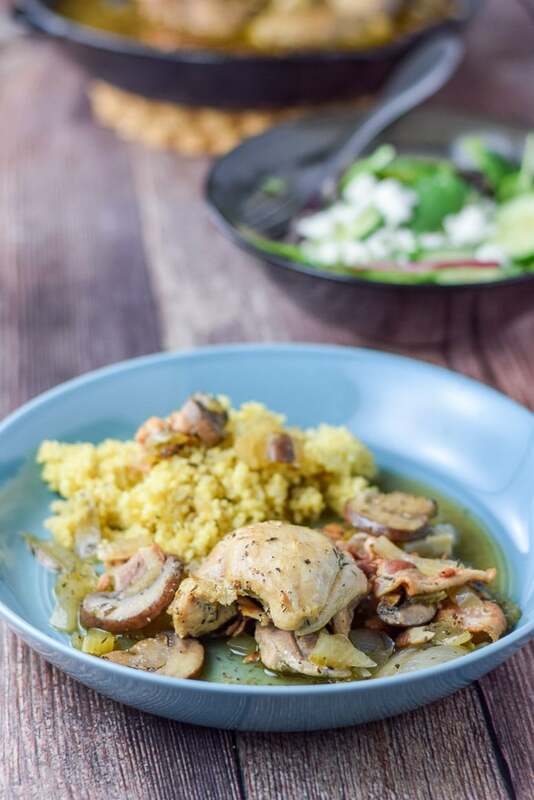 If you’ve tried this coq au vin blanc or any other recipe on the blog, I’d love the hear what you thought about it in the comments below. I love hearing from you! You can also FOLLOW ME on FACEBOOK, TWITTER, INSTAGRAM and PINTEREST to see more of my delicious food and delightful cocktails! 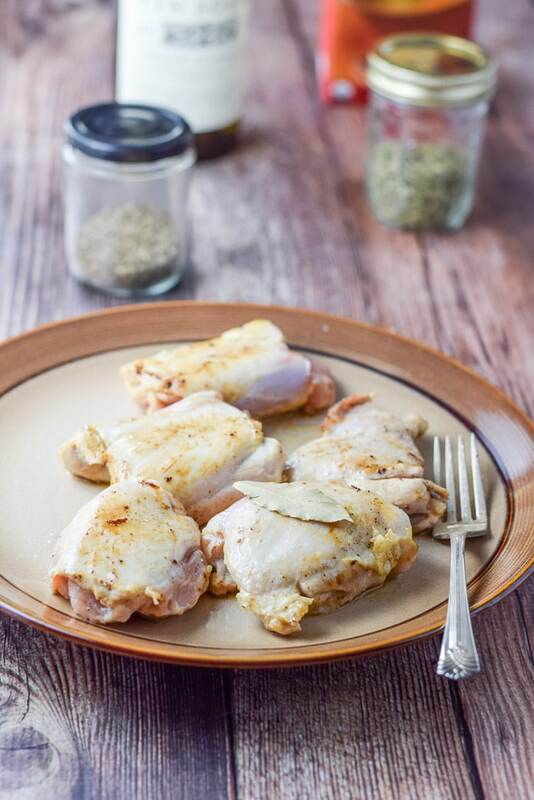 A delectable chicken dish that is so easy to make!! You will Laura! I know you will. This looks amazing! I need to make this very soon! Your post really hits home for me, since my food photography is continually evolving and I frequently shudder when I see some of my earliest attempts. And yes, I certainly do drool at the bacon—at least the way that YOU have it photographed! 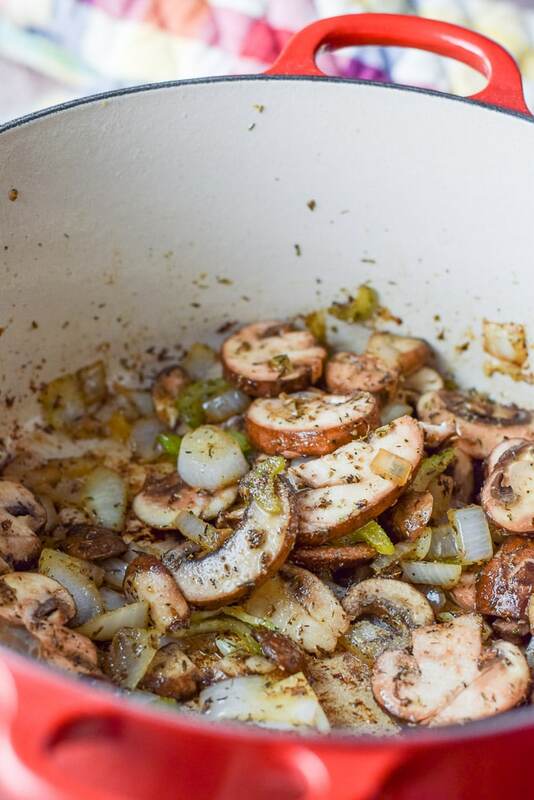 🙂 Coq au vin is an all-time fave of mine, and I can’t wait to try your version! Thank you so much Michelle! I appreciate that! YUM Elaine! I’m not only drooling at your bacon, but at all the goodies in your recipe, looks so tasty! Will try your recipe very soon, pinning it! Thank you Patty! You are a doll! Superb recipe, Elaine! I’ve never made Coq a Vin before. Don’t know why, I mean seriously it has everything I love in one dish! Delish! You will love it Beth! Yup I totally drool when looking at bacon and cringe when looking at my very first post photos ! haha but yes we must all embrace our imperfections and understand that everything is a learning process! 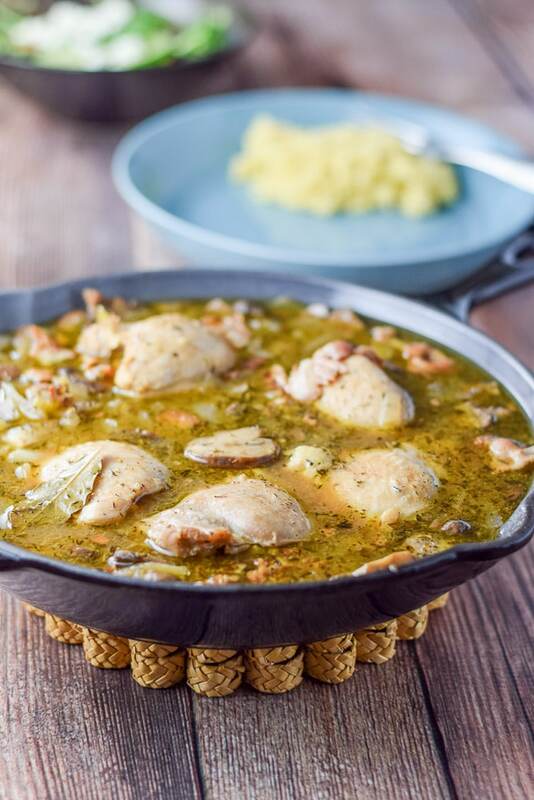 Love the sound of this dish and gorgeous step by step photos! Thank you Vicky! And I agree! Embrace it! You know, one of the things I love about blogging is how it pushes me to learn and improve, and I also really find it very inspirational to go back through the archives of sites that I love and realize that they, too, have improved their photography over time. So I would urge anyone on the fence not to go delete from the archives – it makes me admire and love a site all the more to see how it’s evolved! I so agree Monica!! Very well said. Thank you for that!